Seal 13, Skywalker is also known by it’s Archetype: “Prophet“and “Culture Bringer”. (is “Culture Bringer” a reference to the ‘seeder of life’ in today’s Postulate?) Seal 13 corresponds to Mars and S-P Circuit Four (Externalizing Intelligence) which it shares with Saturn. Skywalker belongs to the Signal Family who guard the Earth’s Southern Regions, and her Solar Plexus Chakra. DALI gathers in our Crown Chakra and it Targets Thermic Force. “My Father in Intrinsic Awareness. I Feel the Heat.” Today we begin the first part of the Sensory Quantum of the Unified Telepathic Time Atom of Yellow Week Four. We also telepathically construct the Top of the Radion Cube. During Yellow Week Four, each day telepathically connects to two 28 Day Moons. “By the Seven Powers of the return of the Seven Solar Witnesses, we are establishing the Cube of the 144,000 within ourselves.” “As an Earth Wizard in league with God, the Divine ONE, you are telepthaically rehearsing the perfection of the Human Soul.”: This Resonant Week 4, we have the closest Resonance with the Seven Solar Witnesses for this entire year: We are aphasically linked to them because tomorrow is coded by the First Solar Witness: Kin 194: White Crystal Wizard. Today, DALI 22 corresponds to the first of the last Seven Moons of the 13th Baktun: Crystal Wizard Moon which begins on May 30, 2012. The first of the Seven Mystic Moons (between Moon 201, Rhythmic Dragon Moon which contains the end of the Cycle on December 21, 2012; and our Galactic Synchronization on July 26, 2013) White Resonant Wind Moon (kin 202) beginning on January 10, 2013, is also time-compressed into Dali 22. Telektonon Day 22 is when we telepathically rehearse the “Completion of the Warrior’s Cube of Intelligence in 2012″, also known as New Jerusalem. We celebrate Pacal Votan’s promise of 13 Baktuns fulfilled by the power of the 9 Lords of Time, and the Telepathic redemption of the Lost Planets. The Resonant Moon Cube Journey always ends on the PSi Chrono Kin 138: Galactic Mirror. During the Resonant Moon of Red Magnetic Moon, Year, Kin around the Planet practiced the Sounding of the Lost Chord. On Day 16 (1/31/2007) two Kin (138 and 221) in New Zealand witnessed the ‘Eye of God’ after performing the final ‘Sounding‘. The ‘Eye’ looked just like this photo, but with turquoise surrounding it, and with the Full Moon as the pupil of the ‘Eye’. Valum Votan later told TMQ that Kin around the world witnessed ‘celestial confirmations’ or ‘Thanks’, and that ‘the Sounding was a success’. The Guide for today is Yellow Planetary Sun: 20.10. In the Southern Hemisphere, 2010 is begining with a ‘Blue Moon.’ The Northern Hemisphere experienced two Full Moons in December. Here in New Zealand, the Moon was Full at 8.13 a.m. on January 1, 2010, so the Full Moon tonight will be a ‘Blue Moon’ on the 21st day of Blue Resonant Night Moon. Today’s Occult is Self-Existing Moon. It so happens that the Kins coding this Self-Existing Year (4.4), Moon (3.7) and today (12.10) add up to 19. 21 (21-13 tones =8) or 19.8: Blue Galactic Storm! Here is an example of the unconscious workings of the Noosphere, which Stephanie accessed directly, and which is then confirmed by: ‘Number; the Language of Telepathy’. Seal 19, the Catalytic Storm, is simply entitled “God” in it’s chapter in ‘The 260 Postulates of Time“. The Hunab Ku 21 which codes this day of the Moon, is ‘overlaying’ the Tone 8 of Harmony. Kin 99: Blue Galactic Storm ‘Perfectly’ fits Stephanie’s theme of ‘Catalyzing’ in ‘Cosmic Harmony’. We can also think of the 99 representing the ‘double‘ Full Moon, Seal 9 twice. By focusing on today’s Challenge, we find examples of how ‘Spirit‘ ‘Communicates‘. Seal 12, Human is also known as “Sage” and “Wise Judge“. “Sage exemplifies Wisdom as the source of Prophecy, and Prophecy as the enactment of Wisdom.” Human corresponds to S-P Earth and the critical Circuit Three (‘Telektonon, Earth Spirit Speaking Tube’) which is shared with Uranus. Seal 12 belongs to the Core Family which guard the Equatorial Tropics and the Heart Chakra of the Earth. 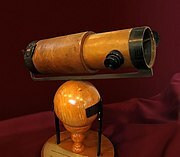 Today’s PSI Chrono Kin (Red Resonant Earth) is also a member of Core Family, and ‘holds’ S-P Uranus on the other end of the Solar Prophetic Circuit Three, which epitomizes the ‘Earth Spirit Speaking Tube’. It’s interesting to note on this G.A.P. day focused on ‘Spirit Speaking’, coded by two members of Core Family, that the Core Family (which also include Wind and Hand) always code the Solstices and Equinoxes. Located in the 17th position of the Seventh ‘Mystic’ column of the Tzolkin, Kin 137 is known as the ‘Ah Vuc Ti Cab ‘ who is the chronographic ‘Keeper of the Resonant power of the Earth’s core’. Ah Vuc Ti Cab is “the Mystic Lord of the Center of the Earth, the mediator of the commands of Hunab Ku (source of the energetic or radial plasmas) to the rest of the Biosphere. 12 years ago today, the first transmission of the information about the 7:7:7:7 was received by Valum Votan on Resonant Moon 21, (Jan. 29, 1998; Kin 231: Planetary Night) and continued on through Resonant 28 of the Yellow Overtone Seed Year. SILIO concentrates in our Heart Chakras, and its action is to Discharge. “My Role is to Accomplish the Actions of the Buddha. I Discharge the Mental Electron Neutron at the Center of the Earth.” The Telepathic Quantum is completed, and united to the Sensory Quantum by Blue Catalytic Kali, becomes the Occult Telepathic Time Atom. We now ‘place ourselves inside’ the Radion Cube we completed yesterday, and Discharge ourselves and the Blue Time Atom to the Center of the Earth. Let’s powerfully connect with the ‘Mystic Lord’ at the Center of the Earth, and the Radial Plasmas he ‘guards’. This G.A.P. day coded with the PSI of his Kin 137 is a particularly powerful day for performing the Circumpolar Rainbow Bridge Meditation. http://www.lawoftime.org/timeshipearth/rainbowmeditation.html Please remember to Radiate pure Love, Wisdom and Healing to all of Creation afterwards. Here is a video http://www.youtube.com/user/rysa5#p/u/0/cni3iuDWBvg about the Heart, Love and Healing, which also contains some Full Moon images. On Silio 21, the last day of Blue Week Three, we telepathically connect with the 7th year of ‘The Mystery of the Stone’ (2010-2011) and it’s Bolontiku: “Single Wing Red Fire” His Heart Oracle is coded by the 7th Solar Witness: Kin 200, Yellow Overtone Sun. Telektonon Day 21 corresponds to the Establishment of the Noosphere as the Kingdom of Heaven on Earth between 2000-2011. Envision the Planetary Human we are becoming: We have attained “full 4th-dimensional understanding, a Return to Nature, Restoration of the original garden, Planetary Consciousness and Galactic Memory. Sounding the Double Octave of the Lost Chord…Day 21 (PSI 137) Kin 192 SP Earth (10) Core/Heart, Yellow Human Tone 10…Fifteenth Note: RE (D)…Step 15: “First Supreme Time, First Red Castle of turning, Enter the Court of Birth”…Cube 15; Eagle S-P Jupiter (52) Vision-“Awesome Blowing Six Turquoise Winds” (8th Bolontiku)…Sound RE (D) and TI (B) One day remains in the Resonant Moon Cube Journey. 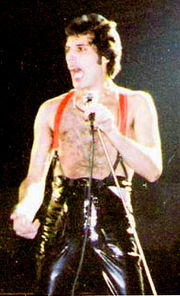 Tomorrow will be the 62nd Anniversary of his death on White Cosmic Wind. (Kin 62 is today’s Antipode: Planetary Wind) Some of Mahatma Gandhi’s ashes, which were secretly kept by a friend, will be scattered at sea off of South Africa’s coast, tomorrow (Red Spectral Skywalker) to commemorate this 62nd Anniversary. Today’s Kin number is a palindrome which also contains the numbers of its seal and tone: 11.9, and of a globally transformative event (9/11) which was also coded by the Monkey (11.4). The September 11, 2001 tragedy that crippled the world’s financial center was the ‘puncture in the technosphere’ that leads to the ‘Advent of the Noosphere’. The Guide for today is Kin 87: Blue Solar Hand, which is a Pacal Votan Clear Sign, and whose Seal and Tone numbers (7.9) delineate the 16 day Cube Journey. 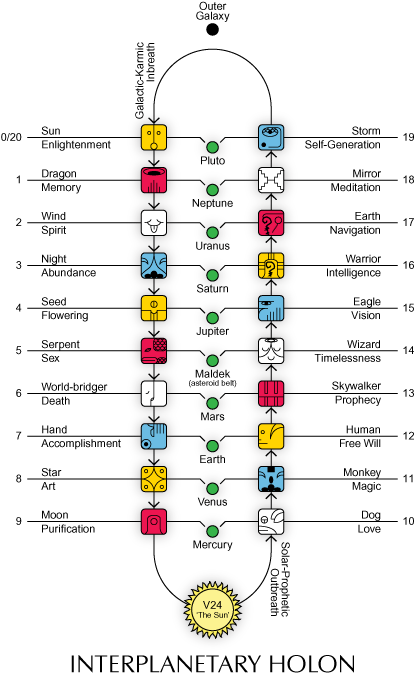 The ‘Seven Prophets of the Awakening’ code the first Seven days (and the 7 Radial Plasmas), while the ‘9 Lords of Time and Destiny’ (9 Bolontiku) code the final 9 days which contain Bolon Ik’s Nine Weavings. Today’s PSI is coded by Seal 16 (Rhythmic Warrior). Two days remain in the special Resonant Moon’s 16 Day Spirit Warrior’s Cube Journey. Seal 11, Monkey, is also known as “Magician” and as the “Blue Alchemist“. As the generator of the Blue Electrical Circuit, the Magician complements the Serpent Initiate as the generator of the red electricl circuit. “Magician exemplifies Magic as the beginning of Prophecy.” Seal 11 corresponds to Venus which shares Circuit Two with Neptune. Monkey is a member of the Cardinal Family who guard the Regions of the North, and the Earth’s Throat Chakra. LIMI gathers in our Solar Plexus (Manipura) Chakra, and it’s action is to Purify. “I consume Dualistic Thoughts as Food. I Purify the Mental Electron at the North Pole.” Today we ‘build’ the Left and final side of the Radion Cube. “Absolute Sequence Heptagonon of Mind Complete. (14:20)” LIMI 20 corresponds to this year (2009-2010), the 6th year of ‘The Mystery of the Stone“, when we awaken the 6th Lord of Time: “Awesome Vast Blue Sky“. This news analysis suggests that this week, http://www.whatdoesitmean.com/index1329.htm we took a big step towards Peace. It appears that hostilities in Afghanistan are about to cease. Let’s ‘Pulse our Magical Intent‘ into this ‘turning point’ becoming the Peaceful world that almost all of Humanity fervently desires. Sounding the Double Octave of the Lost Chord .http://www.lawoftime.org/pdfs/Rinri-III-3.2.pdf…Day 20, Kin 191, S-P Venus (7) Cardinal/Throat , Blue Monkey Tone 9…Fourteenth note: MI (E)…Step 14: “Second Supreme Time, Second White Castle of Crossing, Enter the Court of Death”… Cube 14: Wizard SP Maldek (28) Timelessness- 7th Lord of Time: ‘Single Wing Red Fire’…Sound MI (E) and LA (A). (Today we Sound the 3rd ascending tone and the 3rd descending tone) The Resonant Moon Cube Journey at the center of the 13 Moon Year always falls on the 16 PSI Chrono Kin in the middle of the 7th central ‘Mystic Column’ of the Tzolkin Matrix. Tomorrow will be PSI Kin 137, Red Resonant Earth, on day 21 of the 7th Resonant Moon. Blue Solar Monkey is the Galactic Signature of Sir Isaac Newton, an ‘English physicist, mathematician, astronomer, alchemist and theologian, who is considered by many to be one of the most influential men in human history’. 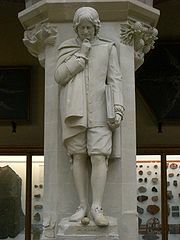 Sir Newton was very religious, yet remains the person that scientists (as recently as 2005) consider to have made the greatest contribution to Science and Mankind. Kin 190: White Galactic Dog on Resonant Alpha 19; Cube 13: Prophecy. The Antipode Watch is coded by P.V.C.S. and G.A.P., Yellow Galactic Sun, which is the Galactic Signature of Pacal Votan. Seal 10, Dog, is the first Kin to begin the S-P (Solar-Prophetic) Return Journey. Dog is also known as the “Compassionate One” and “Divine Loyalty“. “The Compassionate One exemplifies the power of love as the unconditional regard for the well being of all creatures.” Seal 10 corresponds to S-P Mercury and Circuit One (the Alpha-Omega Recharge) which includes Pluto. Dog is a member of the Polar Family which guards the North Pole and the Crown Chakra. ALPHA gathers in our Throat Chakra, where its action is to Release. “My Country is the Unborn Ultimate Sphere. I Release the Double-Extended Electron at the South Pole.” Today we mentally construct the first of the 3-part Occult Telepathic Quantum, and the Right Side of the Radion Cube. Alpha 19 is connected to the Blue Electric Storm Year (2008-2009), and the 5th and only Feminine Bolontiku; ‘Supreme Golden Maiden’. Telektonon Day 19 corresponds to Seal 6, Limi, coded by Kin 149, Red Rhythmic Moon. “Victory of the White Horse, 6th Lost Generation”, guided by the 6th Solar Witness, Self-Existing Storm which codes the Heart Oracle of this year’s Bolontiku “Awesome Vast Blue Sky“. Sounding the Double Octave of the Lost Chord…Day 19. 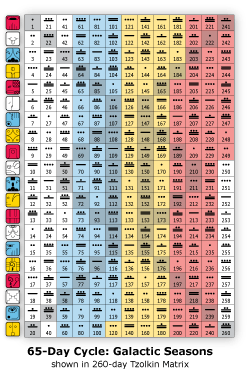 Kin 190 S-P Mercury , Polar/Crown, White Dog, Tone 8….Thirteeenth note: FA (F)…Step 13: “Third Supreme Time, Third Blue Western Castle of Burning, enter the Court of Magic“…Cube 13: Skywalker SP Mars (Bode # 16) Prophecy– “Awesome Vast Blue Sky“…Sound FA (F) and SOL (G) “Awesome Vast Blue Sky” is the 6th Bolon Tiku we are awakening during this 6th Year of the Mystery of the Stone, and this 13th Cube Year of Prophecy. This Magic Turtle Day resonates in more ways than one. For this rare ‘double Resonant Moon’, here is an image that evokes its main components: Water, Red, and a Moon about to rise in a sky that resonates with the water’s surface. The name of this Lake: Mono, is an anagram of Moon! The Postulate for 9.7 states: “The release of Radion is intensified by Yogic activity and sexual-sensory excitation, consciously augmented as Sensory Teleportation. This category of activity and experience establishes a primary level of radiosonics or Radiosonic Architecture: The creation of telepathic imaginative structures capable of “transport”.” What an intriguing Postulate! The Antipode for Resonant Moon is Blue Resonant Storm, which codes the Year of the 2012 Harmonic Convergence. Synchronistically, Resonant Moon, today’s Kin, coded the Year of the 1987 Harmonic Convergence! Seal 9, the Moon, is also known as “Healer” and “Moon Priestess“. The Healer exemplifies healing as the source of Love, and is the guardian of the universal water that nurtures and sustains all beings. Moon corresponds to G-K Mercury (the last of the G-K cycle) which is on Circuit One with Pluto. Seal 9 belongs to the Gateway Family who are the Year-Bearers, and who guard the South Pole and Earth’s Root Chakra. Catalytic Blue KALI gathers in our Secret Center (Svadhistana) Chakra and its action is to Establish the bond between the Sensory Quantum we built during the first three days, to the Telepathic Quantum we will build during the next 3 days, thereby merging the two into the Telepathic Time Atom. “My Name is the Glorious Lotus-Born. I Catalyze the Light-Heat Within.” Today we build the Back of the Radion Cube. Kali 18 is UR Earth Day 5: Day Earth. Blue Kali 18 of Blue Week 3, is the ‘Central Kali’ of each year. Today’s G.A.P. Kali in the middle of Blue Resonant Night Moon is a most Resonant and Transformative one. Kali 18 corresponds to the 4th year of the Mystery of the Stone (2007-2008), and it’s Bolon Tiku, whose Heart Chakra is coded by the 4th Solar Witness. Telektonon Day 18 correlates to Seal Five which is coded by Kin 44: Yellow Overtone Seed, and to the fall of Babylon. The 5th Lost Generation is guided by the 5th Solar Witness, White Electric Mirror. Sounding of the Double Octave of the Lost Chord. 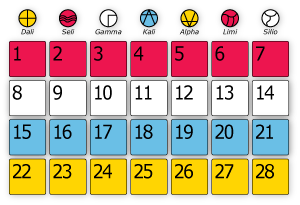 Day 18, Kin 189, GK Mercury (4) Gateway/Root Red Moon Tone 7…Twelfth Note SOL (G)…Step 12: “Fourth Supreme Time, Fourth Yellow Southern Castle of Giving, Enter the Court of Inteligence...Cube 12, Human SP Earth (10) Free Will – Supreme Golden Maiden…Sound SOL (G) and FA (F). Red Resonant Moon is the Galactic Signature of English Poet, Mystic and Artist William Blake. He believed that Imagination is “the Body of God“, or “Human existence itself“. 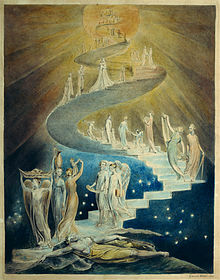 Here is his painting of Jacob’s Ladder, which can be interpreted as the Bridge between Heaven and Earth. It could also portray the ascending and descending octaves of our “Lost Chord “. The Antipode and G-Force of Rhythmic Star is Pacal Votan Clear Sign and G.A.P. Rhythmic Mirror (Kin 58). The day of Pacal Votan’s death was coded by White Rhythmic Mirror. Today’s Analog is coded by Seal 11, Rhythmic Monkey, on this 11th day of the Cube. The Occult, Seal 13, Galactic Skywalker, codes the current Cube 13 : Year of Prophecy. The final 16 Year Cube Journey ends on the 2013 Day-out-of-Time coded by Resonant Night (which also codes this Resonant Moon). The first 8 years represented AC: ‘Aboriginal Continuity; Complete Way of Conduct’. On Day-out-of-Time (Crystal Night) 2005 ( between Cube 8, the Star, and Cube 9, the Moon, was the AC-CA Plate Shift, and we entered CA: ‘Cosmic Awareness-Eight Years of Wielding Power’. Here is a crop circle that was discovered on http://www.escapetheillusion.com/blog/2008/08/new-crop-circle-on-august-25th-2008/ August 25, 2008, which means it was ‘laid’ there on Rhythmic Star’s 13.8, Galactic Skywalker Watch or in the early hours of Solar Moon. It’s placement between the two Kins coded by the Star and the moon can represent the AC-CA Plate Shift which happened between the Cube Star and Cube Moon. Here is a 7-pointed Star for Day 17 of Moon 7. Does anyone have ideas on what the symbols mean? Seal 8 corresponds to G-K Venus and Circuit Two which includes Neptune. Star belongs to the Signal Family who code the Days-out-of-Time, and who guard the Southern Regons of the Earth, and her Solar Plexus Chakra. GAMMA concentrates in our Third Eye Chakra and its action is to Pacify. “My Lineage is the Union of Intrinsic Awareness and the Ultimate Sphere. I Attain the Power of Peace.” The Occult Sensory Quantum is now complete, and we now buils the Front side of the Blue Radion Cube. GAMMA 17 corresponds to the 3rd year of the Mystery of the Stone (2006-7), and it’s Bolontiku, Reknown Consch Topknot. Telektonon Day 17 aphasically and telepathically links to Seal Four, coded by Kin 199: Blue Self-Existing Storm and the 4th Lost Generation, led by Red Lunar Earth. “13 Moons Peace restores sacred vision of Heaven as new social form”. The invincibility of the 4th Bolontiku (Garuda), the synchronicities of the matching Venus correlations on this day coded by Lamat, the Star, combined with the beauty and Love of Step 11, creates the most powerful Magic today! Yellow Rhythmic Star is the Galactic Signature of Artist Judy Chicago. “I am trying to make art that relates to the deepest and most mythic concerns of Human kind…” This piece by Judy Chicago demonstrates that. Note the hearts on the wings of the butterflies, denoting LOVE, all arranged within the “Ultimate Sphere” which is divided by a PEACE symbol. Seal 7, Hand, is also known by its archetype, “Avatar” and “Exemplar“. The Avatar exemplifies Cosmic knowledge. Hand corresponds to Earth and the critical Circuit Three it shares with Uranus. Seal 7 belongs to the Core Family which guards the Equatorial Tropics and the Heart Chakra of the Earth. SELI Flows (Luminic Force) and gathers in our Root Chakra. “My Mother is the Ultimate Sphere. I See the Light.” We build the Bottom of the Blue Radion Cube today. SELI 16 corresponds to the 2nd year of ‘The Mystery of the Stone’: 2005-2006, and is aphasically linked toGamma. Telektonon Day 16 correlates to Seal Three (Gamma) and the Third Prophecy, coded by Kin 94: Electric Wizard. The Third Lost Generation is led by the 3rd Solar Witness: Kin 196: Magnetic Wizard. Cube Ten: Love “Pick up the thread of Bolon Ik’s Third Weaving, Cups of the Castigated filled with Peace.” “By my unconscious Dog power of Love, may Prophecy Pacify the Victory of the Righteous!” “May the return of the Sacred Warrior bring Peace, Truth and Love to this afflicted Earth!”. Sounding the Double Octave of the Lost Chord. http://www.lawoftime.org/pdfs/Rinri-III-3.2.pdf Day 16, Kin 187 G-K Earth (10) Core Family/Heart Chakra, Blue Hand, Tone 5…Tenth Note TI (B)…Step 10: “Unification of Consciousness beyond immortality, with consciousness of the Spiritual Plan-Attainment of the Whole.”…Cube Ten: Dog, S-P Mercury (4) Love…‘Reknowned Conch Topknot’. Sound TI (B) and RE (D). Note this is the first Cube position to begin the ‘Return Journey’, signified by the S-P (Solar-Prophetic). 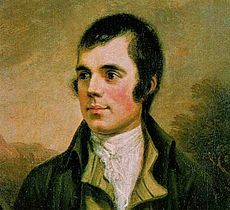 The Scottish poet, Robert Burns was born 251 years ago today, and his birthday is celebrated as a holiday: Burn’s Night http://www.timeanddate.com/holidays/uk/burns-night. His most famous composition is probably ‘Auld Lang Syne’, sung on New Year’s Eve around the world. For this Hand day of Accomplishment, these two quotes show the character of this accomplished poet who was known as “The Bard“: “Dare to be honest, and fear no labor.” and “Firmness in enduring and exertion is a character I always wish to possess.” These are traits we need to “Exemplify” as we approach the Sixth Sun of Consciousness.